The Convergent Pacific team of rail professionals has made a great contribution to the engineering solutions to the North American rail and transit industry. We have earned an excellent reputation for our full range of resources and capabilities in creating innovative and cost-effective design (for rail and trackway, rail and system integration, rail bridge, platform and station shelter structures, overhead contact system pole foundation and caternary wire support structures, as well as power substation and signal/communication building and utility vault structures). 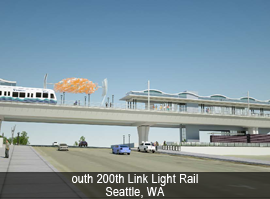 CP has planned and designed some of the most prominent rail and transit projects in North America. Our Transit portfolio includes Portland Tri-Met's Interstate Light Rail, I-205 and Portland Mall Light Rail, Portland to Milwaukie Light Rail, East and West Sides Light Rail Improvement Design/Build, Seattle Sound Transit’s University Link LRT, East Link LRT and South 200th LRT Design/Build, Sacramento Regional Transit’s Downtown- Natomas-Airport Light Rail, Minneapolis Hiawatha LRT, Honolulu LRT, Venezuela's Maracaibo Metro, City of Portland's Streetcar and Streetcar Loop, and City of Seattle's Streetcar. 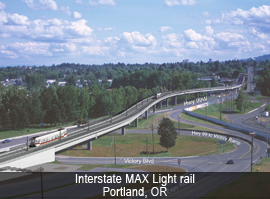 CP's principals, once employed by the world's largest engineering firms, had managed and designed some other significant rail transit projects throughout the United States and the world including Portland's Westside Light Rail, Seattle Link Light Rail, Salt Lake City Light Rail, Minneapolis Hiawatha Light Rail, Sacramento's South Corridor Light Rail, and Northeast Corridor Light Rail, San Francisco's Muni and BART, Los Angeles Blue Line Light Rail, New Jersey Transit's Newark Penn Station to Elizabeth Station First Operable Segment Light Rail, and the Taiwan High Speed Rail. CP Provides a broad range of design components for railway operations, including: Light Rail Transit, Commuter Rail, Freight Rail, High Speed Rail, and Intermodal Facilities. CP offers multidiscipline expertise covering projects from feasibility studies and surveys through preliminary and detailed design, scheduling, cost estimating, contract administration, bid preparation and evaluation, to project and construction management.